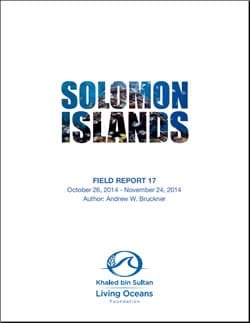 Between October 26, 2014 and November 24, 2014, the Khaled bin Sultan Living Oceans Foundation conducted a coral reef research, outreach and education mission to map and characterize the shallow marine habitats and assess the status of coral reefs and coral reef species in the Solomon Islands. This report is a direct result of research conducted during that mission. This mission was undertaken in partnership with scientists from University of Queensland, James Cook University, University of the Philippines, University of the Azores, National Museum of Marine Biology and Aquarium Taiwan, University of Hawaii-Manoa, Atlantic and Gulf Reef Assessment program, the Solomon Islands Ministry of Fisheries and Marine Resources, Catlin Seaview Survey, and OceansWatch. The research mission focused on coral reefs in five regions: New Georgia Islands (around Munda Village), Gizo Island, Arnavon Islands (Sikopo, Kerehikapa, and Malakobi Islands), Marovo and Nono Lagoon, and Santa Cruz Islands (Vanikoro, Utupua, Reef Islands and Tinakula). conduct assessments and research to understand the current status, health and resilience of Solomon Islands coral reefs. mapping of the spatial distribution and extent of each habitat type; and c) determination of the bathymetry from the shoreline to 25 m depth.